New league held no fear for the lads! The year began with new adventures for Mick’s men as the team entered the DDSL. Excitement built as the players got to test themselves against new players from across Dublin and Mick and the parents/guardians got to test themselves with new directions for away games! The squad really excelled itself in tough conditions in the first part of the year, with the weather wreaking havoc with the schedule. Before the summer break the team had a brilliant cup run which unfortunately ended at the semi-final stage. After the break the team put in some excellent league performances, especially away to eventual league runners-up Loughshinny United FC, roared on by our ever-reliable and vocal support. 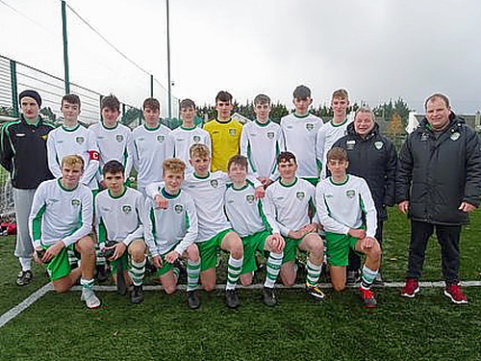 The team continued to motor up the U-16B table with the end of season highlight being a dramatic and well-fought 3-1 win over eventual league winners Drimnagh Celtic FC. The management team has been with this squad for many years and once again every player in the squad showed this season what a lovely bunch of young men they are to deal with. Mick, Paul and Hugh would like to thank players Conor O’Kane, Conor Grant, Killian O’Shea, Christopher Langtry, Max Callaghan, Jack Tuthill, Ciarán Keenan, David Dunne, Aaron Carey, Seán Doherty, Killian Dunne, Mathieu De Michel, Chris Bailey, James McDonnell, Danny Conroy, Eoin Murtagh and Daniel Mouatt for their sterling efforts all season, especially considering the number of injuries picked up during the year. To keep everything going in all circumstances is a testament to these players as team-mates and to their general pleasant manner as young men. A big thank you also to all the parents/guardians; the level of support we receive is outstanding and our various accomplishments could not be attained without your input. We’re delighted to announce that the team will attempt to continue next year so we look forward to seeing everyone in the New Year. In the meantime Happy Christmas to one and all! A great 2018 adventure for all; here’s anticipating 2019!